Notice the Spite Fence behind the house, which Barbara Smith discusses on the video. Charles Crocker was born on September 16, 1822 in Troy, New York into a modest family. He quit school at the age of 12 and the family moved to an Indiana farm when he was 14. He worked on several farms, a sawmill, and at an iron forge. In 1845 he founded a small, independent iron forge of his own. When news of the fortunes to be made in California spread across the nation, Crocker led a party of Forty-niners overland to the Pacific coast, arriving in 1850. Two years in the mines convinced him that mining was no way to make a fortune, and so he opened a store in Sacramento. By 1854 he was one of the wealthiest men in town. Political positions and further business opportunities accompanied Crocker's initial economic gains. 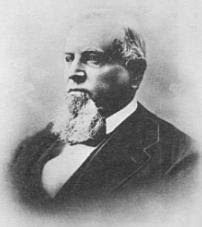 In 1855 he was elected to Sacramento's city council as a member of the Know Nothing Party, and in 1860 was elected to the California' State Legislature as a Republican. In 1861, after hearing a very intriguing presentation by Theodore Judah, he was one of the four principal investors along with Mark Hopkins, Collis P. Huntington and Leland Stanford who formed the Central Pacific Railroad. The men became known as The Big Four and their railroad became the western portion of the First Transcontinental Railroad in North America. Crocker’s position with the company was that of construction supervisor and president of Charles Crocker & Co., a Central Pacific subsidiary founded expressly for the purpose of building the railroad. Crocker managed the actual construction of the railroad. He overcame shortages of money and manpower caused in part by the Civil War by hiring Chinese immigrants to do much of the back-breaking and dangerous labor. He drove the workers to the point of exhaustion, in the process setting records for laying track and finishing the project seven years ahead of the government's deadline. Deming, New Mexico is named after Mary Ann Deming Crocker, wife of Charles Crocker (who is also buried here). A golden spike was driven at Deming in 1881 to commemorate the meeting of the Southern Pacific with the Atchison, Topeka & Santa Fe railroads, completing the construction of the second transcontinental railroad in the United States. Charles Crocker also acquired controlling interest in Woolworth National Bank for his son William, which became Crocker-Anglo Bank. In 1963, Crocker-Anglo Bank later merged with Los Angeles' Citizens National Bank, to become Crocker-Citizens Bank and later, Crocker Bank. 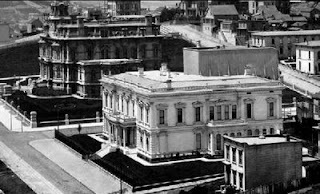 The San Francisco, California based bank no longer exists. It was acquired by Wells Fargo Bank in 1986. Crocker was also an early proponent of the massive irrigation projects which eventually transformed California into a fruit and vegetable growing center. In 1886, Crocker was seriously injured in a New York City carriage accident. He never fully recovered, and died two years later at the Del Monte Hotel in Monterey, which was owned by the family. Crocker's estate was valued at between $20 and $40 million dollars, none of which was used to advance philanthropic causes. According to the American National Biography, Crocker "gave nothing to charity...nothing to public institutions of any kind."